DJ: Fine%%% I know I have those threats, but you also have some internal ko threats around j and at k, and, for what I understand, the follow-up of a, b and c is not very good for my lower left group. Let's discuss it on the appropriate page - at present I have no time either! JoeSeki Let's do back-up, and comment this area well. You have much better ko threats than this one. Consider a-d. I'll take the time to document this on a separate page and back us up later. I don't have the time right now. I've spent three days showing and teaching go from 10:00 to 23:00 at a fair, and I also found time to study the situation. I do not really expect to win the ko, so I have to make do with gaining something from my threats. Threatening to capture the lower left is bigger than the life of my stones. Building strength for the lower left while threatening to kill it is probably best. JoeSeki White 58 I don't know how to gauge the merits of fighting this ko. My guts say it's flower-viewing for Black. JoeSeki White 56 I see no alternatives. AvatarDJFlux; OK then, I'll go on with the ko. It is certainly true that White 52 is huge (but if my analysis is correct, you'll have to exchange a for b, and this should help me to reduce a bit your territory in the lower right), and that if I want to end the ko you'll get a free move or moves - by the way, when you say that two moves are needed to end the ko, do you mean the move that takes the ko plus the one to connect it? Probably the fate of my lower left group will become an important issue. JoeSeki: I appreciate the offer and I agree with the philosophy of backing up and correcting problems that are huge mistakes. In this case though, even though I misread it. I'm not sure if it's a huge mistake. Here is my reasoning for saying that. If Black plays it out, then White gets a ko. While it is flower-viewing for Black, it's not awful for White yet. White has already played White 52, which is very big. 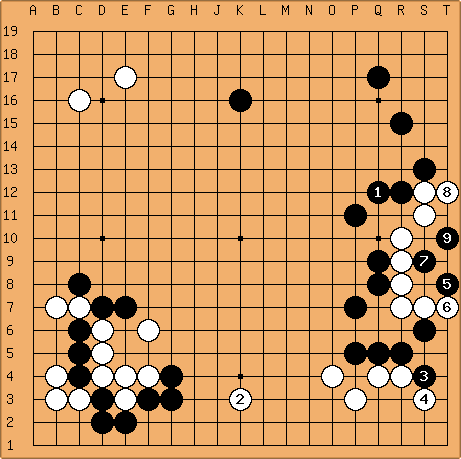 Before Black can kill White on the side, he must play two moves to finish the ko fight. That's two moves in a row to kill the white group. If you give me two moves like White 52, I think I made the better choice of moving at this time. Question: Are the big moves on the board still bigger then the life and death of the white group on the right-hand side? I don't know the answer. But I do know that the looming ko fight will be a burden for White. Isn't there a proverb? "If the group is worth less than 15 points consider sacrificing it"? 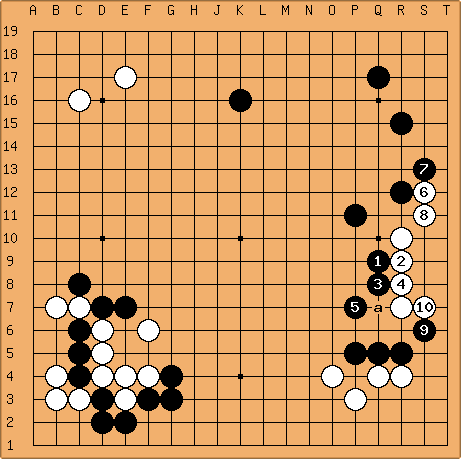 Before I go ahead with the ko (which is a bit of a hanami ko for me, I think), I make you a proposal: this being a teaching game, and a fine (for our level) one so far, we could go back a little, say you use White 52 to defend; and then we could create a page with this real-life tsumego problem for the edification of our weaker kyu kibitzers. What do you think? I went ahead and created the page anyway. Joe and all the others, please correct and edit abundantly! JoeSeki White54: Unless I misread, this is the road to a seki, or life. But I want to be consistent and trustful to myself (euphemism for "I'm stubborn"). I play at your vital point. I would be happy if you prove me wrong: you would have shown me where I have to work even harder to understand anything about this game. By the way, I too perceive the lower side as the most important right now. JoeSeki White 52: I think I'm alive. If I read it out properly the worst that can happen is seki. So assuming that is correct I had a hard time figuring out where to play. This move takes territory for either of us, and I think it makes your black stones on the lower side unstable (I can force you to one eye with an unreasonable fight :). You've got a big moyo on the top side developing, but it's open at the bottom and two moves away from perfection. And there are the black stone on the left side which look suspiciously weak, right? I suspect the proper direction of play is on the left side. So, question for a strong dan player. Assuming the white stones on the right are alive, where is the direction of play and why? AvatarDJFlux Black 51: Look, I think this move should be sente against your group on the left side, unless you want to be faced with a serious ko there (with a hypnotic tone of voice: I order you to believe meee...). I pondered for a long time whether to attack you directly at the vital point, but this is a more solid way of playing (it leaves you fewer ko threats).